The intruder turned on the hall light. A thin solid sliver of light burst underneath the bedroom door but was eclipsed by moving shadows as someone tried to open the door. This is it. A surprising calm descended on Marian. It reminded her of when she had the lead in one of the Hometown Player productions. She was nervous to the point of fainting but once she stepped onto the stage all fear was gone. But this wasn’t make believe. This was to do or die. And she didn’t want to die. She pulled open a dresser drawer to steady her hands as she aimed the 9mm belly high toward the door. Finger on the trigger, she was ready to kill. The .38 was next to her foot ready for back up. The jiggling door knob became quiet. Next was the sound of someone trying to pick the lock. The knob twisted and the door eased open and then stopped with just a small slice of light cutting through the darken bedroom. Marian heard panting on the other side. Then a huge shadow blocked the light that had spilled through the crack of the opened door. Suddenly the shadow was gone and light again flowed into the bedroom. Marian’s mind raced. Maybe they changed their mind. Maybe they went away. She began to relax when nothing happened. There were no sounds, no more shadows. All was at peace. The door flew open as the intruder kicked it open. Bits of sheet rock flew into the air as the door knob smashed violently into the wall. Time stood still as Marian stared at the black heaving silhouette. Its dark malevolent shape reminded her of an angry grizzly bear. She saw the intruder’s arm swing up. The outstretched hand was holding a gun. It swung side to side searching the room for its prey. One of her mother’s odd quotes popped into her brain. You can’t run for a frog. It made sense finally. She couldn’t wait for a savior. She pulled the trigger twice. The first bullet hit the doorframe. Slivers of wood exploded into the air. Marian knew the second one struck its target. The inhuman figure snarled in pain. An agonizing scream hung in the air as the intruder staggered backward. It wasn’t Charlie. Even though the voice was distorted by the siren and the banging. Marian knew it wasn’t his voice. She heard the intruder lumbering toward the front door. Then she heard shots being fired through the door. The new silence was broken by the constant whirling noise of the siren. Marian gasped. They killed the policeman! Hearing the intruder thudding back toward the bedroom, Marian grabbed the .38 and then ran into the bathroom locking the door behind her. She thought about going out the window but there were safety locks. Knowing the locked door would give her a few seconds before the intruder broke in, she knew she didn’t have time to fumble with the locks on the windows and get out. She looked for something, anything that would give her some advantage. She spied a tall cylindrical vase sitting on the corner of the soaking tub. It was filled with yellow tulips and blue marbles to hold them in place. Setting the guns inside the walk-in closet, she grabbed the vase and stood just inside the closet’s door then hurled it toward the middle of the bathroom floor. The glass marbles danced around the tiles covering the floor. Big shards of glass jutted up from the floor like stalagmites. As she shut the closet, she wished it had a lock. She seized the guns and ducked behind some pants hanging in the left corner of the closet. Her back was pressed against the wall. Resting her elbows on her knees, she pointed the 9mm chest high. She waited, hoping the sound of the breaking glass would make the intruder think she had gone out the window tricking the intruder to go outside to look for her. Marian inhaled sharply as she heard the sound of the intruder smash open the locked door. She heard the intruder struggling on the marbles. Fall on the glass. Fall on the glass. The intruder screamed grossly obscene threats as she hit the floor. Charlie is quickly recruited to help solve the murder of a young girl who was on the path to become a nun. The suspects begin to mount as Charlie delves deep into the girl’s life, revealing a sordid and ugly side of the town’s good girl. Charlie tapped lightly on the bedroom door. Marian was sharing his sister’s old bedroom with Aunt Ella, who was too spooked to go home alone. He heard footsteps. Marian slipped out into the hallway wearing a long pink billowy nightgown and robe. Her hair looked as if she had quickly finger-combed it. Goosebumps danced up his back. Man, she’s beautiful, even first thing in the morning, he thought. Charlie grinned and wrapped his arms around her. “I don’t care about morning breath.” His gentle kiss grew more passionate as she slid her arms around him. Marian giggled and kissed his neck. “Mmm, just a little but I was too tired to let it bother me.” Charlie handed her a cup of coffee. “Aw, you’re so sweet, Ma. I feel like the luckiest woman in the world.” Marian wrapped her arms around her new ma and felt at peace. 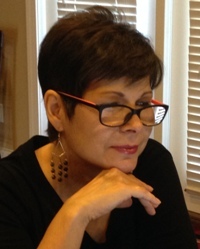 Mary Anne Edwards is the author of The Charlie McClung Mysteries, traditional mysteries with a touch of romance. 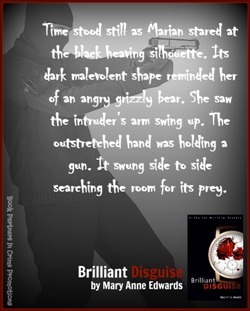 Brilliant Disguise, the first book in the series, was released January, 2014. Its cover was a finalist in the InD’tale Magazine Crème de la Cover contest. 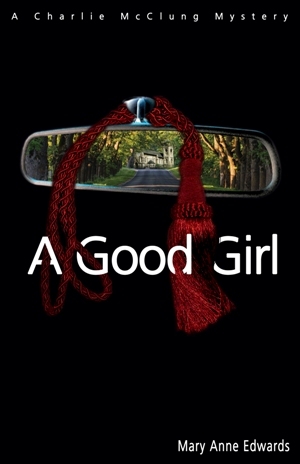 A Good Girl, the second book, was released September, 2014. A Good Girl was voted one of the 50 Best Indie Books 2014 by ReadFree.ly. The third book, Criminal Kind, will be released on June 30, 2015. There will be seven more books in the series. Mary Anne was born in Mercedes, Texas. She now lives in Georgia with her husband of 34 years and her Tuxedo cat, Gertrude. With the encouragement of her husband, she left the accounting world to write full-time. When Mary Anne isn’t writing, she loves watching crime dramas and traveling with her husband. Good morning, Mary Anne, and welcome back! These excerpts are both great. They sound like perfect rainy afternoon reads. Better rainy afternoon reads that late dark night reads 🙂 If Gertrude would jump on my lap during some of those scary parts, I can imagine may things my body might do! Seriously, I enjoyed both booksVRY muc and am eagerly awaiting Book#3. Mary Anne Edwards and her Charlie McClung series can leave the reader pining for the next book to come out. I love the fact that Charlie has found a partner to share his escapades with. Thanks for the review. Great openings! I look go rward to reading the rest of them. Mystery, romance, surprises and good food – these books have something for everyone! Thank you for stopping by, Laura. I’m deeply grateful for your kind words. Looking forward to you adding to the Charlie McClung series, Mary Anne! 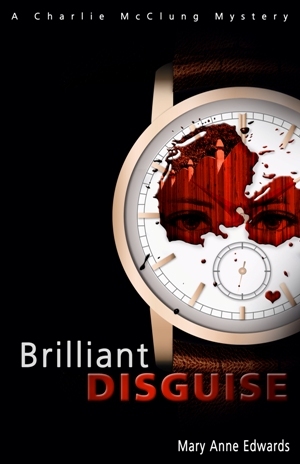 When I read a Brilliant Disguise, I couldn’t get it read fast enough, yet I didn’t want it to end. I read many books twice as I hate to think that I may have missed out on one tiny aspect of a story. Charlie and Marian are a great book couple and you almost wish that you knew a couple just like them to be friends with and to be your neighbors. 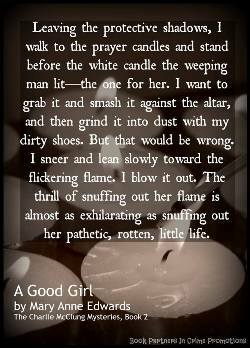 This was a fabulous book and Mary Anne has done it up right again with a Good Girl. If you have not read these books, do yourself a big favor and order them today.